In 2018, Anastasia joined Grand Wealth Management after having managed her own, independent advisory firm. The alliance appealed to her as an ideal solution for delivering new levels of client care to her existing relationships, while positioning her to serve a growing client base. 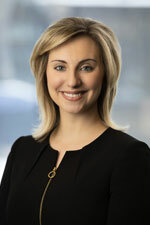 As an experienced financial advisor, Anastasia is the lead advisor for many of our clients. Employing Grand Wealth’s two-advisor approach to client care, she also brings her valued perspective to other client relationships. Anastasia’s core strengths and interests include advising women, offering executive wealth management, assisting individuals in transition and engaging in retirement planning for professionals. In addition to serving individual investors and their families, Anastasia also manages 401(k) plans for small- to mid-sized companies throughout the Midwest. Immediately before joining Grand Wealth, Anastasia owned her own wealth advisory firm; before that, she was an executive and wealth advisor at two other local wealth management firms. While pursuing her law degree at Valparaiso University, she focused her studies on tax, business and estate planning law. She obtained her undergraduate degree from the honors business program at Albion College, where she majored in economics with a focus in finance and accounting. She is a member of the State Bar of Michigan, the Women’s Lawyers Association of Michigan, and the Grand Rapids Bar Association, and is a CERTIFIED FINANCIAL PLANNER™. In and around the community, Anastasia serves on the boards of the Lake Michigan Estate Planning Council and the Spectrum Health Community Council. She is also a member of the Junior League of Grand Rapids and volunteers at several other community organizations focused around childhood health and well-being. Anastasia also reserves time for her own growing family and a number of personal interests. In the fall of 2018, she and her husband (also a local attorney) are welcoming their second daughter into the world. As a family, they enjoy hiking, spending time with friends, and taking part in the vibrant Grand Rapids community. Through our wealth management process we look forward to learning what is important to you and introducing you to our professional team. Click here to subscribe to Financial Insights, Grand Wealth Management's quarterly electronic newsletter. Grand Wealth Management, LLC is an SEC Registered Investment Advisor located in Grand Rapids, Michigan.